We finished 2015 in Nashville, Tennessee. We started 2016 in Louisville, Kentucky. Of our three-stop Southern road trip, Louisville was the only city I'd visited before. In fact I'd been there a few times, but only on work-related matters, and never saw much other than the New Albany, Indiana courthouse (just on the other side of the Ohio River) and my hotel. That hotel, though, was a pretty special one. The 21c Museum Hotel in Louisville is very possibly one of the greatest places I've ever stayed. Its name is not just a marketing ploy: the basement is a gallery dedicated to 21st century art featuring both rotating exhibitions and selections from the hotel's own collection, and the focus on contemporary art permeates the entire space. In addition to the gallery downstairs, artworks are incorporated throughout the property. 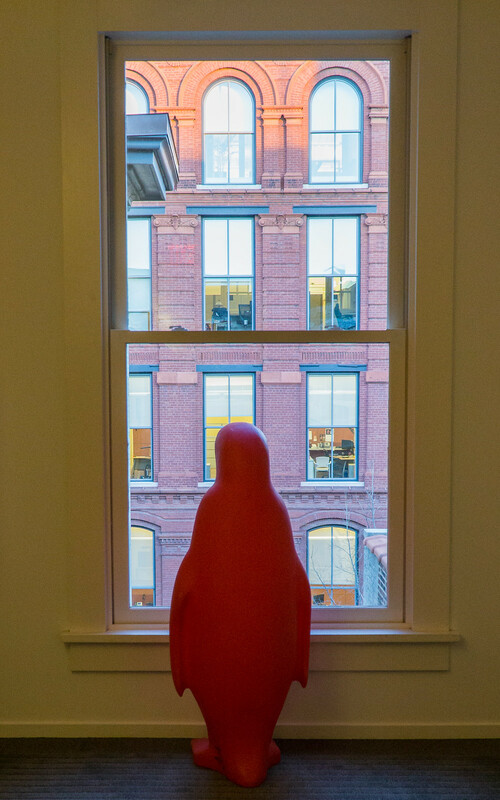 Their signature red penguins (originally a commissioned art work for the 2005 Venice Biennale created by Cracking Art Group) lurk everywhere (and the staff regularly moves them around, so that you may exit your room in the morning and find one staring at you). 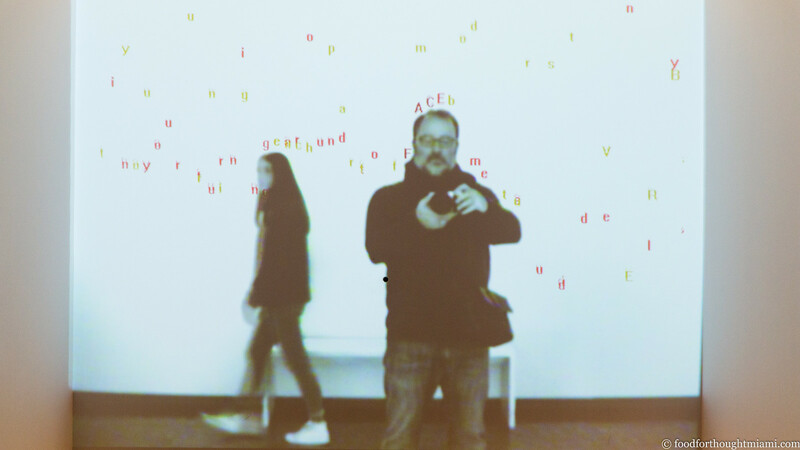 The area in front of the elevators features an interactive digital video installation called "Text Rain" by Camille Utterback, in which letters cascade down upon a projected silhouette of the people standing in front of it. A chandelier festooned with menacingly pointed manicure scissors hangs in an upper floor common space. (You can see all my pictures of the hotel in this 21c Museum Hotel flickr set). The 21c also has a great restaurant – Proof on Main. During my earlier visits, the chef was Levon Wallace – who recently left Louisville to open a Cochon Butcher with Donald Link in our last stop, Nashville. The Proof kitchen has since changed hands a couple times, first to Michael Paley (who recently moved on to Austin, TX to open Central Standard), and now is run by Mike Wajda. Despite all the turnover, it's as strong as ever. (All my pictures from the restaurant are in this Proof On Main flickr set). Other appetizers are equally creative, like a sweet potato pop-tart with a chicken liver pâté "frosting" and a sprinkle of crispy cracklings, which was a hit even among the non-offal fans at the table. Even the more traditional stuff, like a smoked catfish dip or the house-made charcuterie, is well done and tasty. I'm accustomed to a fall-off from the appetizers to the mains, but that wasn't the case at Proof. In fact, even a potentially nebbish dish like a stuffed chicken was done exceptionally well. 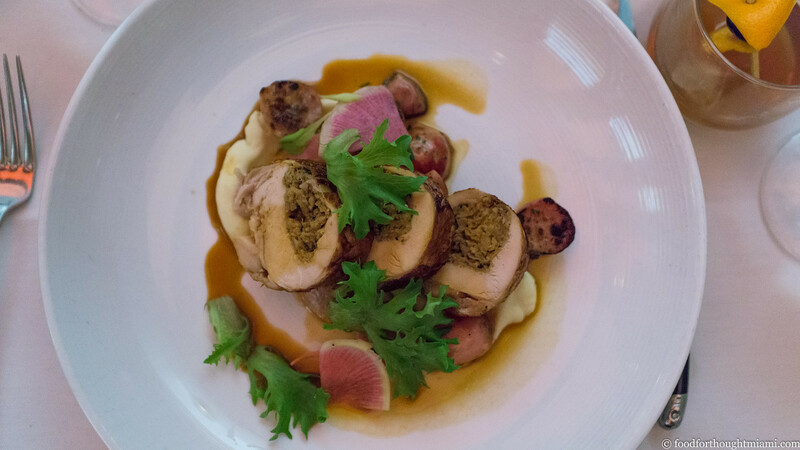 This hen roulade (the bird came from Marksbury Farm in Lancaster, Kentucky) was one of the best iterations I've ever had: flavorful, juicy chicken, crisp skin, a savory smoked pork stuffing, a dappling of jus, some roasted and fresh winter vegetables underneath. The "hog and dumplings" was also great, a Caribbean -Southern hybrid with a brightly jerk-spiced pork sausage ragu topped with big puffy featherweight dumplings that were like oversized gnudi. 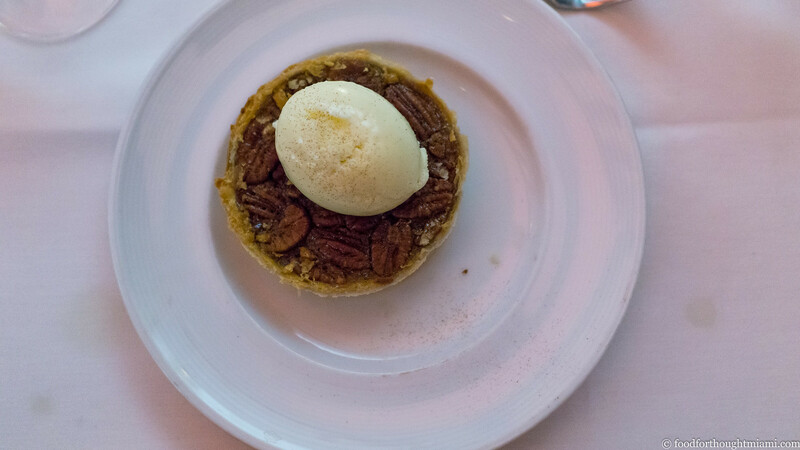 Pecan pie can be cloyingly sugary, but Proof's finds a nice balance with a shot of Kentucky bourbon for a bit of an edge, and a scoop of buttermilk gelato for some creamy tang. If that's not sweet enough for you, every dinner finishes with a big pouf of pink cotton candy. 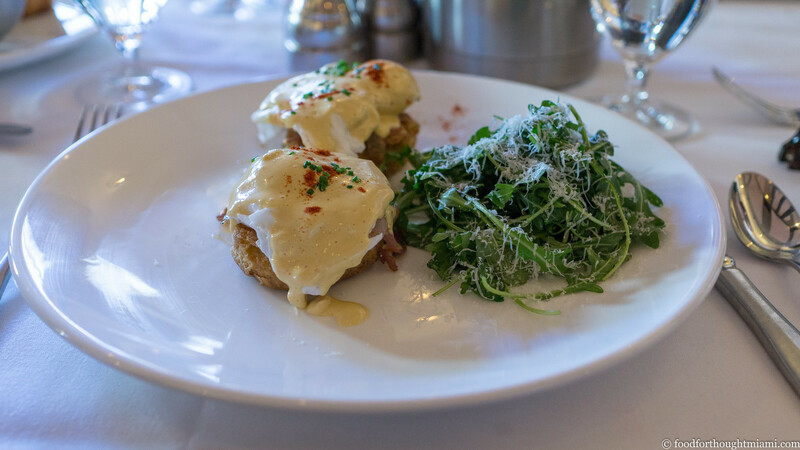 While many hotel restaurants mail it in for breakfast, we ate well in the mornings at Proof too, like their southern take on eggs benedict with a cornmeal biscuit, country ham and red-eye hollandaise, and an inspired smoked salmon and egg salad sandwich on everything-spice brioche. The bar at Proof also lives up to the name, and stocks one of the broadest – and most fairly priced – bourbon selections I've encountered, some of which can be sampled in themed tastings like the "Bottled In Bond" flight. The following day featured more bourbon, as we started the morning at the Frazier History Museum down the street. In addition to a nice Lewis and Clark exhibition (I am a sucker for things Lewis and Clark related), there was also an exhibition on Prohibition and Kentucky, sponsored by the (completely impartial) Kentucky Distillers Association. 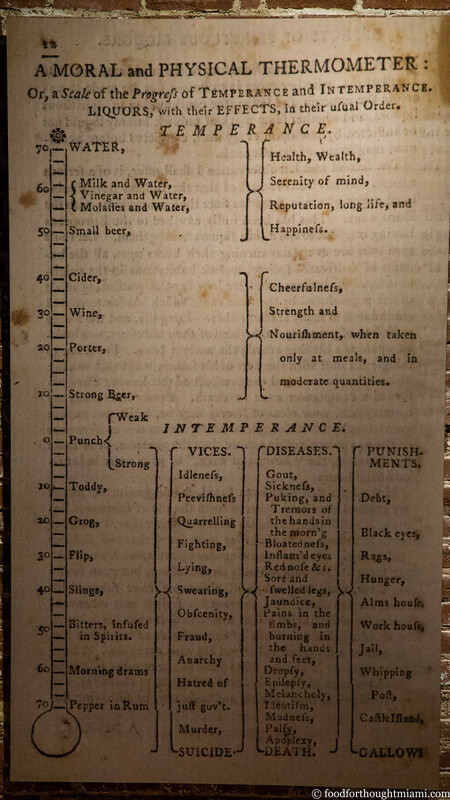 It featured some great pieces of temperance propaganda, like this "Moral and Physical Thermometer" of temperance and intemperance. Clearly, the descent is quick from idleness and peevishness to suicide, death and the gallows. It was also interesting to see the federal prohibition permit issued to Frankfort Distillery, then the producer of Four Roses Bourbon, which allowed it to be one of the few distilleries that could continue selling bourbon for "medicinal" purposes throughout prohibition. The exhibition makes a pretty compelling argument that prohibition was counter-productive in many ways: it depressed the economy, encouraged excessive illicit drinking, fostered organized crime, and overtaxed the court and penal systems, which spent an overwhelming proportion of their resources dealing with prohibition-related crimes. All of which just made me want to have a nip of the stuff. Fortunately, we'd made arrangements to do a tour at Willett Distillery in Bardstown that afternoon. 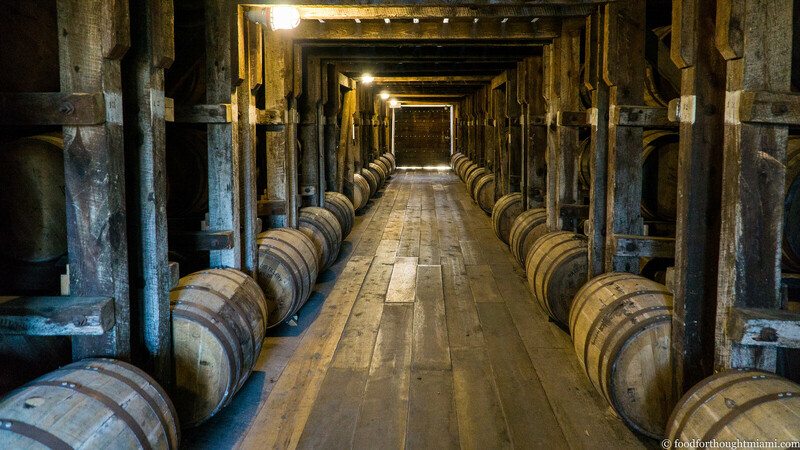 Willett is an old distillery that's gotten a new lease on life. The Willett family has been in the whiskey business since shortly after the Civil War, and the Willett Distilling Company was founded in 1936. During the 1970's energy crisis, the distillery was shut down and dismantled as the property was shifted to ethanol production – a decision that proved only temporarily lucrative. In 1984, Even Kulsveen (who had married Martha Willett) bought the property out of bankruptcy and founded Kentucky Bourbon Distillers. For a couple decades after the original Willett stock ran out, KBD purchased bourbon from other distilleries which it distributed under several brands (Old Bardstown, Johnny Drum, Noah's Mill, Rowan's Creek, Kentucky Vintage); but in 2012 Willett (mostly, it seems, under the guidance of Even Kulsveen's son Drew), had reconstructed the distillery and resumed making bourbons on site. It's still a very small scale operation, run almost entirely by family, and produces a fraction of the bourbon made by its Bardstown neighbor, Heaven Hill. (You can see all my pictures from the distillery, plus – cute kitty alert! 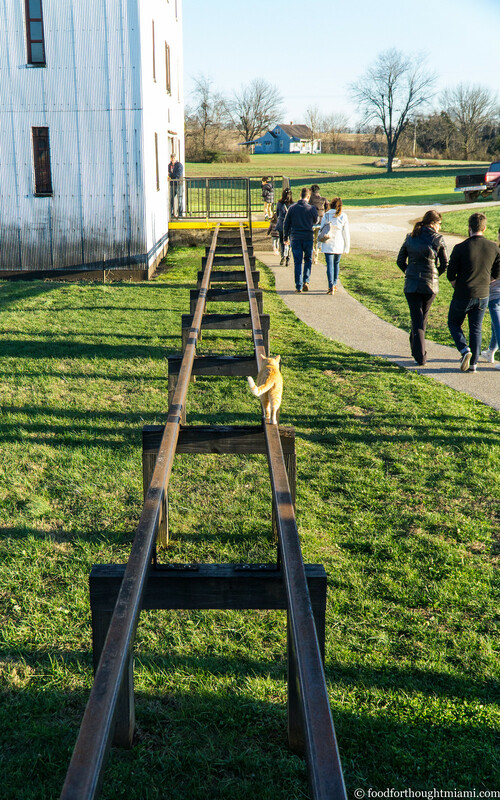 – a few shots of the cats who patrol it) in this Willett Distillery flickr set). The day after New Years Day they were a bit short-staffed, but that proved lucky for us as we were guided through the facilities by Willett's lead distiller, Terry Ballard. What he lacked in typical tour guide glibness he made up for with his knowledge, earnestness and obvious passion. He showed us the grains they use in their mash, much of which is sourced locally; and showed us around the bubbling fermentation tanks filling the air with the dank, heavy, perfume of the sour mash, the copper pot still they use to distill the mash; the barrels into which it's decanted, and the rickhouses where it's aged. Plus, at the end of the tour we got to sample some of the wares. I've been a fan of the Johnny Drum Private Stock since a bartender at Proof turned me on to it a couple years ago, and have always liked the Willett Pot Still Reserve, Noah's Mill and Rowan's Creek without even knowing they were all produced by the same folks. But I was particularly enamored of the Willett Estate Rye, which is one of the first products they're releasing that's produced entirely on site. 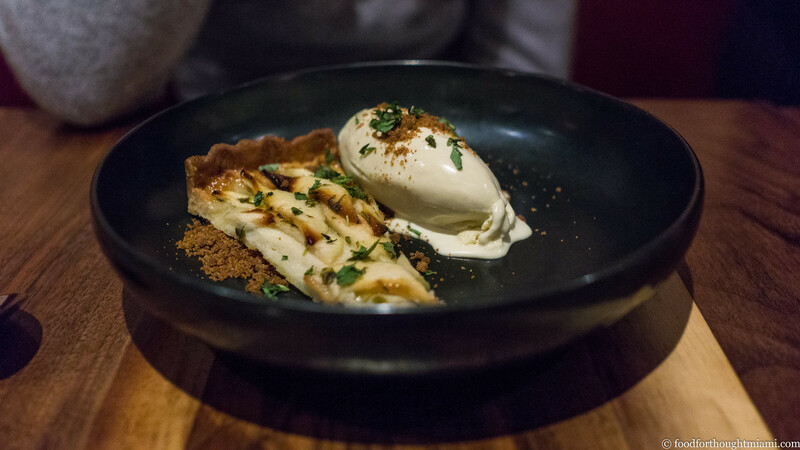 For dinner, we headed to Chef Edward Lee's MilkWood. Lee, between his James Beard nominations and appearances on Top Chef and Mind of a Chef, may be Louisville's best known chef – a somewhat surprising honor to be held by a Korean-American born and raised in Brooklyn. His flagship restaurant is 610 Magnolia, which he's run for more than a decade. The more casual MilkWood opened three years ago, just a few blocks down Main Street from the 21c in the basement of the Actors Theatre of Louisville. Lee describes MilkWood as "comfort food with an Asian pantry." 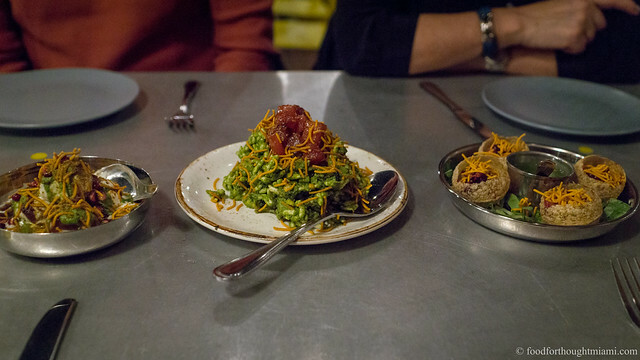 That South-meets-East idea is epitomized in a side dish of collards and kimchi, but you can see the premise in action throughout the menu. Some dishes skew distinctly to one side or the other, like an appetizer of pimento cheese and spoonbill caviar spackled onto pork rinds, dusted with "ham salt" and served over a scallion pesto, on the one hand, or grilled kabayaki eel with puffed rice, smoked coconut, green apple and ginger zest on the other. And some come entirely from left field, like octopus "bacon" served in little nubs tossed with smashed potatoes and kalamata olives over a jalapeño purée and sour cream. Main courses follow suit. Smoked pork shoulder is slicked with a "black BBQ sauce" that includes soy sauce, black bean paste and sesame oil, and plated with coconut rice, okra and edamame. 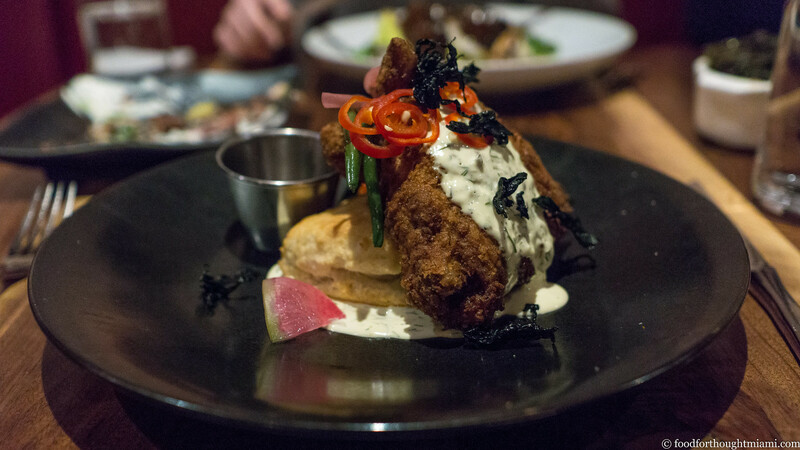 Fried chicken is accompanied by a biscuit and buttermilk dill dressing, but also a ponzu sauce for dipping. 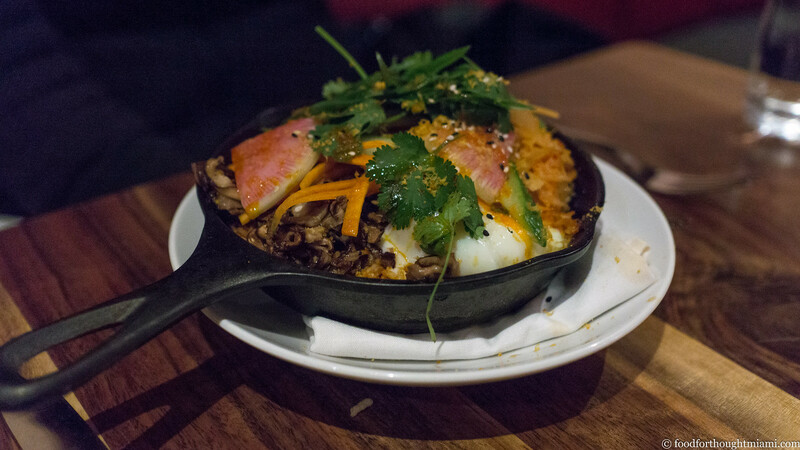 A crispy rice dish topped with fresh and pickled vegetables and a gochujang cured egg emulates the Korean classic, bibimbap, but served in a cast iron pan. (You can see all my pictures in this MilkWood - Louisville, Kentucky flickr set). There was just one problem; or, maybe two. To paraphrase Alvie Singer: the food wasn't very good; and, such small portions. That is too harsh: nothing was really actively bad. But nothing really stood out as remarkably good either. 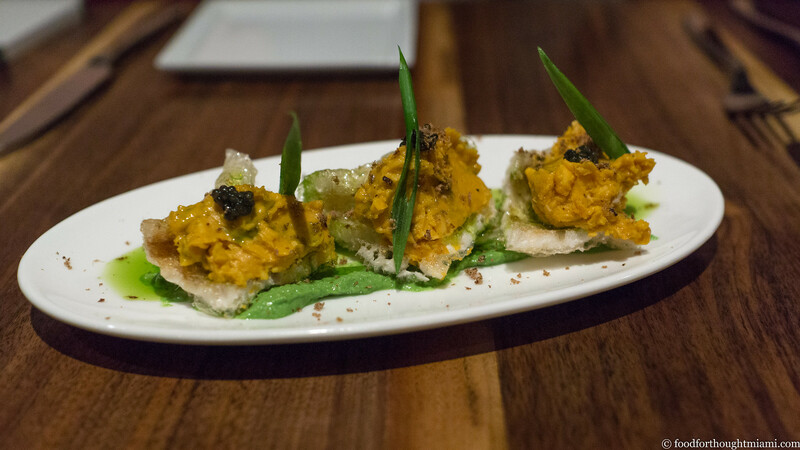 Those pimento cheese topped pork rinds tasted almost exactly like what you'd expect if you shmeared pimento cheese on a pork rind – not a bad idea at all, but the spoonbill roe got lost in the mix and the scallion pesto felt extraneous. I'm not sure what made the octopus "bacon" (maybe it was supposed to be like bacon bits on top of a loaded potato with sour cream? ), or what the different components of the dish were doing together. The fried chicken was adequate but unexceptional, other than that $18 seemed an exceptionally high price to pay for a meager quarter of a bird (and if the next item in the dish description is "charred green beans," maybe give me more than three?). Similarly, a burger with "umami ketchup," bacon and pimento cheese was dwarfed by its bun. And the "crispy rice" – a dish for which we had high hopes, given Chef Lee's Korean heritage – was nothing of the sort, the cast iron pan used for show rather than to create that crunchy edge which is the best part of a dolsot bimbimbap. The cocktail menu is cleverly matched up to the sweet-salty-bitter-sour-umami flavor "map" of your tongue (even though that map has been largely discredited), then split between brown and neutral spirits. I went salty with a "Big in Bangkok" that combined Four Roses bourbon, peanut butter, lime and Thai bitters. If you like the idea of eating pad thai while holding a sip of bourbon in your mouth, you'd like this drink (you won't like this drink). For the second time this trip, I couldn't hold a server's attention long enough to order a replacement, even after grimly sucking it down to get it off the table. The best of the desserts was a really nice pear and frangipane tart, served over a bed of crushed ginger snaps with a chai ice cream and a scatter of fresh tarragon leaves. I wasn't mad at the blood orange panna cotta topped with a crumbly pistachio tuile, either. A togarashi cheesecake with a miso caramel navigated the sweet-savory waters more successfully than my cocktail, but was once again an almost comically small portion – smaller than a typical bookmark and a half-inch tall. I like the ideas behind the menu at MilkWood. I wish the execution had been stronger. There would be time for one last meal before our afternoon flight home. We would have it at Garage Bar, a wood-fired pizza joint in a converted auto service garage. The regular menu at Garage Bar is pretty tight: about a half dozen pizzas, which can be supplemented with some sliced country hams and a short selection of snacks. The brunch menu is similarly concise, subbing out those snacks for some more typical brunch-y type items. We figured we'd stay in the sweet spot by sharing some hams and a pizza, and that worked out really well. 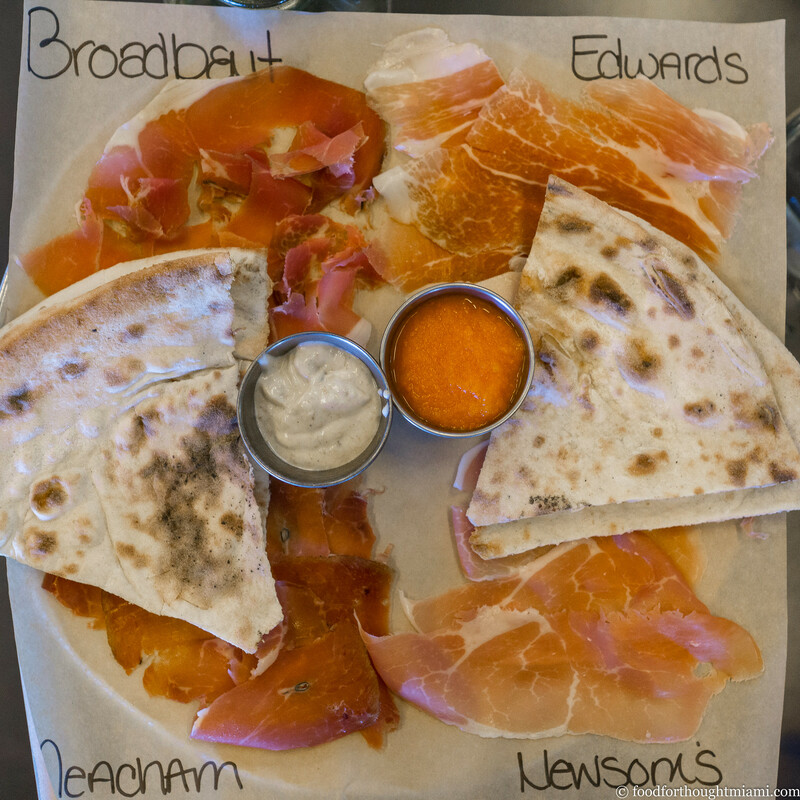 A tasting platter of four different country hams – Broadbent, Meacham, Col. Newsom, and Edwards (which sadly was shut down by a fire, hopefully temporarily, only a couple weeks after this meal) – really showed off the finesse of this great southern product. I wish I'd kept tasting notes, as while these were all delicious, there were clear distinctions of salt, sweet, smoke, nuttiness, meatiness, delicacy and assertiveness in flavor. Some warm puffy beignets dusted with powdered sugar provided a sweet counterpoint to the salty hams. (All my pictures are in this Garage Bar - Louisville, Kentucky flickr set). Most brunch pizzas go the carbonara egg and bacon route. 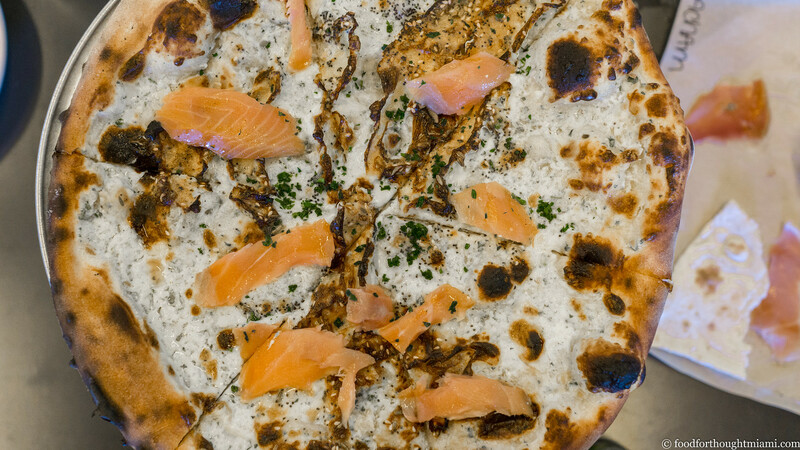 Here, they took a different path, making an "everything bagel" pizza topped with smoked salmon, fennel, hard cooked eggs, and a cream cheese flecked with poppy seeds, sesame seeds and fresh herbs. It was a clever combination and also just a technically great pizza: the crust hitting that equilibrium point between supple, chewy and crisp, with blistered air bubbles pockmarked here and there from the hot oven. This road trip was a fun way to close out 2015 and start the new year. And while we had a few misses, we also had some really great meals, both high and low, along the way. You can read about the rest of the trip in these Memphis and Nashville travelogues, and see the full map of our trip plans (including about five times as many places that we didn't get to) in this Memphis / Nashville / Louisville Google Map. After my first visit, I told Mrs. F that we had to do a weekend in Louisville if for no other reason than to stay at this hotel. She thought I was crazy. Now that she's been, she understands. Whiskeys labeled as "bottled in bond" must comply with the requirements of the Bottled-in-Bond Act of 1897, including that they are made by only one distiller, at one distillery, from one distilling season, aged for at least four years, and diluted with nothing other than water, to no less than 100 proof. As a means of ensuring provenance and safety, the requirements are probably somewhat archaic, but they still are a pretty reasonable assurance of a decent whiskey. This flight featured Old Granddad, Henry McKenna 10-Year Single Barrel, and E.H. Taylor10-Year Small Batch. The standout for me was the E.H. Taylor, with a butterscotch smoothness and a bit of tobacco spice, though it only barely edged out the bright, spicy Henry McKenna. 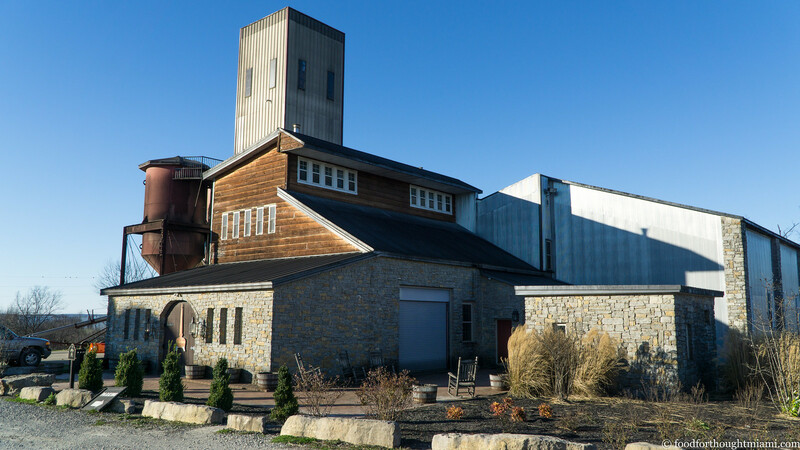 For an interesting little glimpse into the more recent history of Willett, read these reports from 2001 and 2006, which is a bit of a microcosmic look at what's happened in the bourbon world over the past decade or so. Just one little nugget of wisdom I picked up: the bright, spicy Rowan's Creek is made with the barrels from the top of the rickhouse, which get the most heat; the smoother, creamier Noah's Mill comes from the cooler bottom levels of the rickhouse, where it ages more slowly (and ultimately gets bottled at a higher proof). For that matter, the eel appetizer was also a minuscule portion, and the crispy rice likewise was somewhat insubstantial as a main course. I rarely complain about portion sizes, but this all seemed a bit precious, particularly given the environment which, given the low-slung basement space, exposed brick and red leatherette banquettes, feels a lot like a rec-room. That's not a complaint about the decor itself, only the incongruity between the surroundings, the prices and the plating. It may not have helped that three of the culprits – the eel, the burger and the cheesecake – were all Frod Jr.'s orders, who is in a much better position to complain about not having enough to eat than myself. 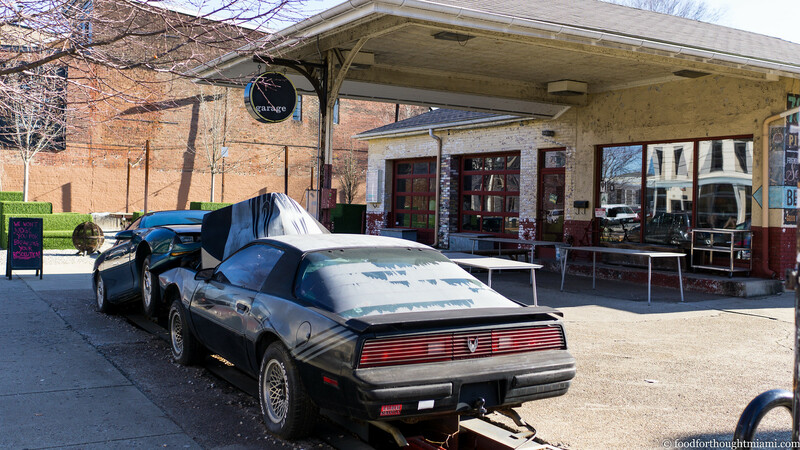 Those crashed cars in front of the restaurant are an art installation called "Slow Inevitable Death of American Muscle" by Jonathan Schipper. Both cars are attached to a machine that slowly pushes them into each other, simulating a head-on-crash in extreme slow motion. My first thought when you started with 21C and Proof on Main, was "Awesome". My first thought when you started on Milkwood was "oh no!". For a city that boasts the highest density of independently owned chefs and has so many great restaurants, it is not a good representation.